Source: "A Clean Break", Foreign Policy magazine. The conclusions are part of the publication’s Global Cities Index, which ranks 60 cities depending on how “integrated” they are with the rest of the world. 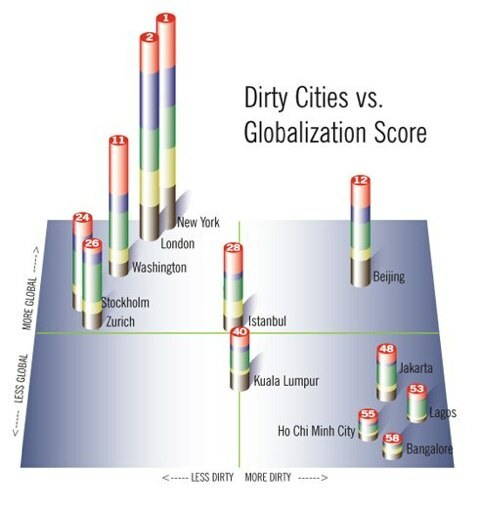 The index, published by Foreign Policy in partnership A.T. Kearney and The Chicago Council on Global Affairs, gives each city a “globalization score” according to 24 metrics across five different dimensions: business activity, human capital, information exchange, cultural experience and political engagement. When compared with the 2007 Mercer Consulting ranking of health and sanitation around the world, Foreign Policy found that rapid urbanization (which brings with it more people and more waste) doesn’t necessarily result in dirty cities. For example, some of the world’s biggest cities, Washington, Stockholm, Zurich, and Boston, also rank in the cleanest top 20 of 215 cities. The problem of cleanliness, then, depends on how a city’s level of integration with the rest of the world and its access to resources. The problem for today’s developing giants like Lagos, Ho Chi Minh City, and Bangalore is a matter of scale. Their populations are so much bigger, and their resources are scarcer, that they don’t have the luxury of decades to solve their sanitation problems. All of which means it may be harder for the next generation of cities to clean up its act.